As a general rule, the fluffier a pet is the better. Fluffy things are cuter, more cuddly, and funnier when they move; it’s a win-all situation. But like all general rules, there are always exceptions. In this case the exception is fish. Fish, as many will have already noticed, are not usually fluffy. Indeed it would be reasonable to put forward the hypothesis that fish and fluffiness are mutually exclusive and, for healthy fish, this is certainly the case. Unfortunately fish cannot always be healthy and sometimes unhealthy fish go fluffy. The cause of such fluffiness is an oomycete, or water mould; a type of organism which looks like a fungus but is closely related to kelp. Specifically, it is caused by the oomycete Saprolegnia parasitica, which infects freshwater fish. S. parasitica causes grey/white cotton wool like patches on the skin and gills of infected fish and can coat up to 80% of the host’s body. These patches are external signs of destruction of the host’s skin and underlying tissue and this result in lethargy of the host, making it more susceptible to predation. If the host avoids predation, symptoms of late stage infection are impaired osmoregulation, which is caused by increased haemodilution due to the large scale surface wounds. This is followed by respiratory failure, caused by the extensive infection of the gills. Organ failure is the final result. 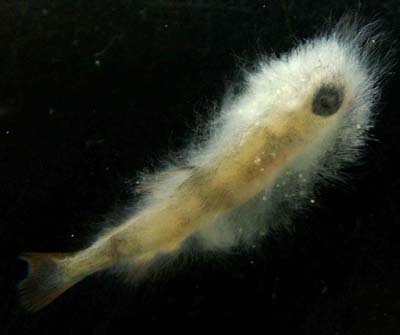 A closely related species, S. diclina, also infects fish eggs. Despite the bizarre symptoms, infection by Saprolegnia is no niche occurrence. Whilst it is generally not an issue for wild fish, generally only infecting wounded or otherwise immunocompromised individuals, it is a considerable problem in aquaculture hatcheries and farms, due in part to the overly high densities in which fish are kept. In these environments, losses of more than 10 % due to Saprolegnia are commonplace and as high as 50% in some more extreme cases. Furthermore, it has a significant economic impact, with conservative estimates putting the losses due to Saprolegnia infection at five million pounds per year in Scotland alone. That Saprolegnia infection is so endemic in aquaculture indicates generally low health in the fish population and highlights issues within the industry. Fluffy fish may not be cute but they can’t be ignored. Packaging: Is there mushroom for change? It’s nearly Christmas and nowadays that seems to mean lots of online shopping. There’s nothing quite so convenient as avoiding the crowds, anxiety, and Christmas music on loop in favour of leisurely browsing from the comfort of your couch. For the most part, deliveries these days are highly reliable, even when you’ve ordered something that doesn’t do well with rough handling—perhaps a new set of glasses, or a bottle of champagne. It’s thanks to the use of packing materials such as polystyrene that we can even consider ordering such fragile items online. Yet despite their convenience, there are a whole host of environmental concerns that come with traditional packing materials. Most people have heard that this sort of packaging never breaks down, and while that isn’t strictly true, polystyrene discarded in landfills, or left as litter will not degrade for hundreds of years. Our love for packing peanuts and Styrofoam has left us with a mass of polystyrene clogging up our landfills and environment. But what if there was a better option? Enter mushroom materials, the brainchild of Ecovative. 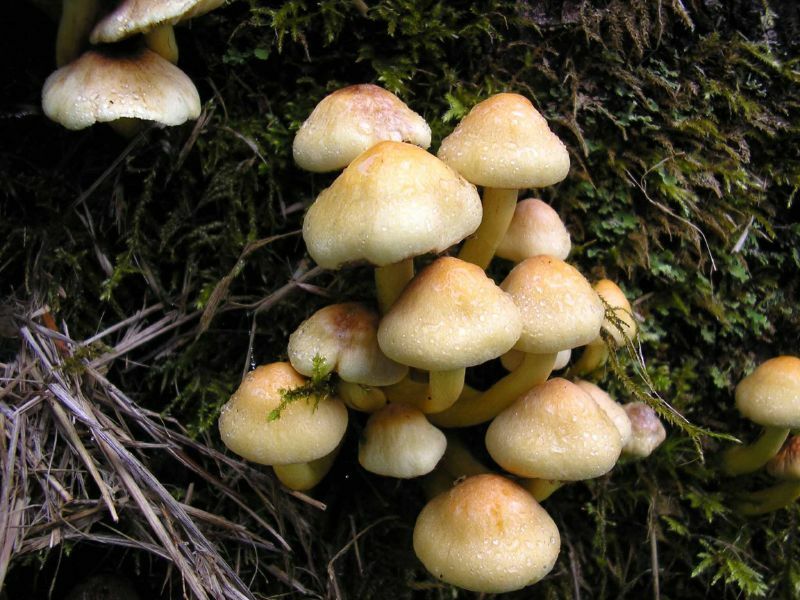 As an alternative to the petroleum-based polystyrene that forms a majority of the packing market, mushroom materials use only natural agricultural waste, such as cornstalks, and mycelium, or the “roots” of fungi. The agricultural waste is placed into a specific mould, through which the mycelium are able to grow, turning the material into a solid block. After growth is completed, the material is fully sterilised before being shipped out to their growing base of customers. The use of agricultural waste in producing the blocks is only the beginning of their environmental benefits. Not only is this a use for otherwise discarded waste products from farming, but the products themselves are fully compostable at home. No need for expensive processing or complicated techniques to degrade the blocks—just break them up and leave in your garden. Besides the obvious market in packaging materials, Ecovative are branching out into other areas, including furniture and even surfboards! There materials are perfect as light-weight foam cores and fins for surfboards, with the added benefit of being entirely degradable in a marine environment if the board is lost. The materials are also being developed for use as structural biocomposites, using “Myco Foam” that has been heat and pressure treated to compress into “Myco Board” for use in furniture that has no need for the addition of resin (and thus the use of formaldehyde), unlike traditional wood composites such as MDF. Who knew fungi could be so much fun? 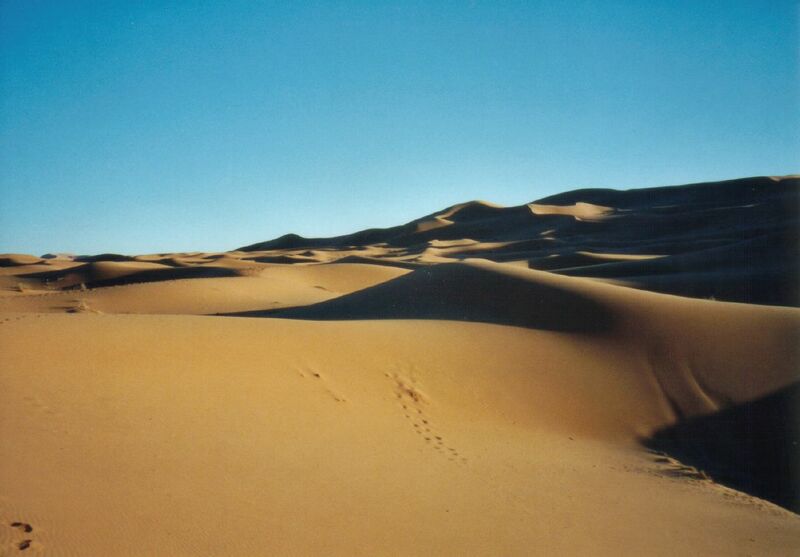 The Sahara Desert is not something you would usually associate with abundant life and vibrant algal blooms. It is one of the most arid and inhospitable areas in the world, representing the largest subtropical hot desert on the planet. And at well over 9,400,000 square kilometres- i.e. about the size of the United States, it is perhaps one of the most inhospitable areas globally. To say that it is unwelcoming to life is an understatement of epic proportions. However, the desert is in fact one of the cornerstones of continued survival of one of the most abundant groups of organisms on the planet: the phytoplankton. This vast swathe of barren land is actually responsible for a dazzlingly complex and diverse ecosystem albeit thousands of miles away. Tiny flecks of sand, red in colour due to the abundance of the element iron, are picked up the winds floating across the sand dunes, and in turn, carried thousands of miles westwards on the air currents. These tiny grains of iron rich sand then land in the ocean off the West coast of Africa, where they are responsible for sustaining a astounding array of life. Though individually insignificant and of little relevance, the sheer scale of their deposition makes them a globally relevant input- it is estimated that something in the region of 1015g/year get deposited courtesy of these Saharan winds Westwards. That’s 1012kg, or 1 billion tonnes! But why all the fuss about iron though? Iron represents a fundamental micronutrient required as a cofactor for the enzymes of a ubiquitous number of different phytoplankton, from cyanobacteria to coccolithophores and diatoms to dizaotrophs. In particular, iron acts as an essential constituent of the enzyme nitrogenase, responsible for the fixation of atmospheric nitrogen. The photosynthetic organisms present in this group are globally significant in terms of the fixation of carbon dioxide from the atmosphere. These so called “forests of the ocean” contribute as much to the control of CO2 levels as tropical rainforests. 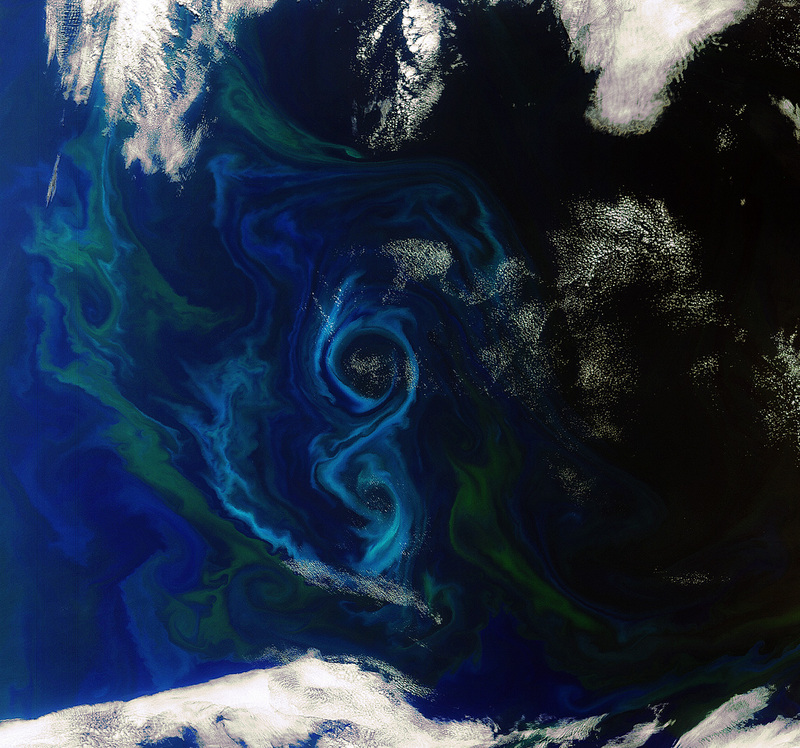 Given their dependence on iron then, there has been considerable interest in the concept of “iron seeding” the oceans as a means of generating blooms of these photosynthetic organisms. Such a sudden population rise would lead to increased CO2 drawdown and may have the potential to mitigate, at least in part, some of the consequences of continual anthropogenic mediated CO2 release into the atmosphere. Efforts doing this are still in progress but who would have thought the Sahara Desert, byword for desolate, bleak and lifeless, may have acted as the inspiration for one of the most ambitious biogeoengineering projects currently underway. Society is slowly forgetting about deforestation. That’s not in the sense that we forget it’s happening, but rather forgetting to care. I am one of the few who consciously try to recycle, to use less paper, to switch off lights. My family only recycles because otherwise the normal bin will overflow. My roommate has commented that environmental issues have been made up, as it’s “convenient” to allows us Westerners to stop development in other parts of the world. 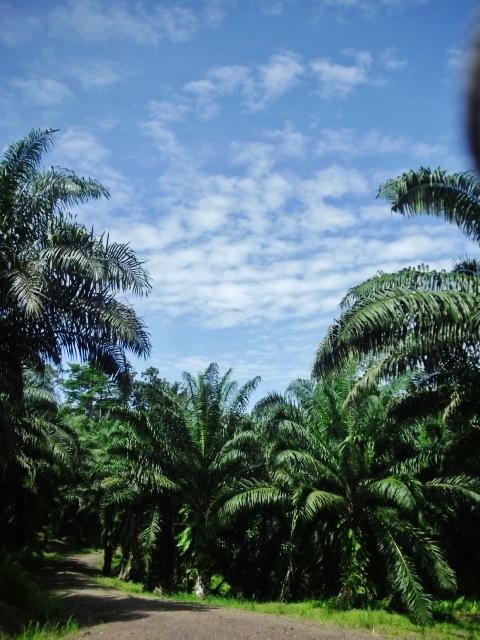 The Bornean Rainforest – how long will it last? Even Rhett Butler, the man who founded a website that tracks global deforestation and has “devoted tens of thousands of hours to the cause of protecting forests” is not promoting a change in society’s attitude. He unwittingly commented that “lately – for the first time, really – I’ve started seeing cause for optimism about the future of forests”. This was gloriously picked up by the Independent in an article titled “Rainforests ‘out of danger’ thanks to global giants”. This is like thinking world peace will work out next year. Now clearly Mr Butler did not mean his words to seem that all of the world’s deforestation issues are resolved. 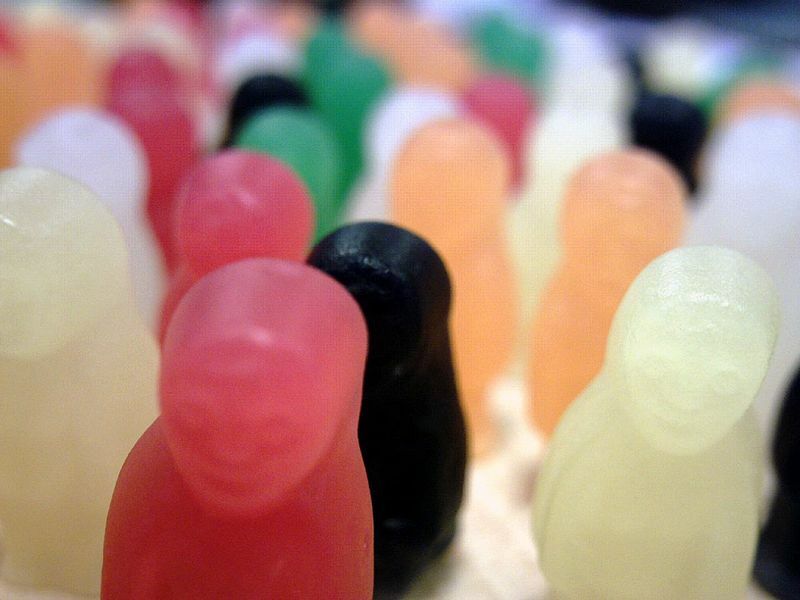 I’m also delighted to hear Sally Uren, head of the sustainable development charity Forum for the Future, say “there is a much greater sense of shared responsibility and I am feeling reassured by the seriousness with which many big multinationals are taking this responsibility”. But these are just words and many people will jump for joy that they can jump off the eco-friendly bandwagon. 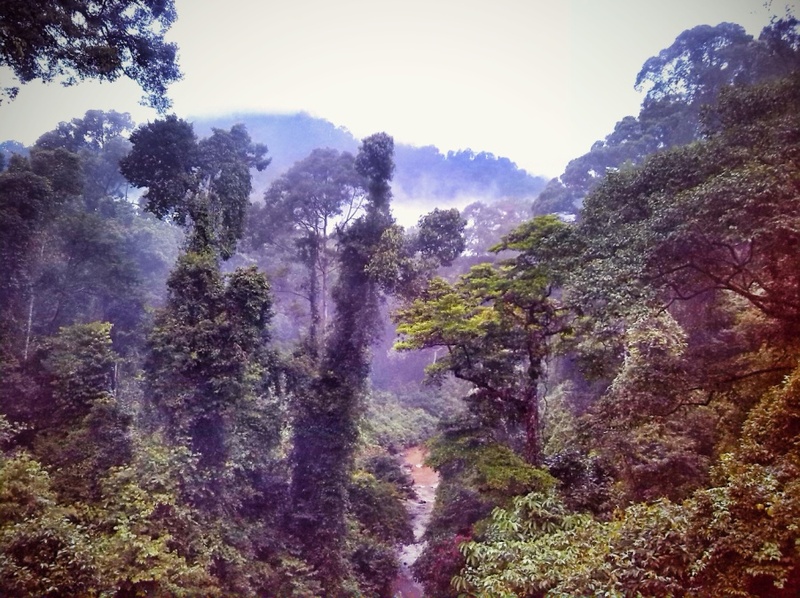 Visiting the rainforest of Malaysian Borneo has made the issue or tropical forest conservation real to me. Driving into the heart of the land you see the town turn into jungle. Then once you get into the core primary rainforest, you realize what you thought was jungle earlier is just the left-over bones. The growing demand of palm oil (have a look at most labels and you’ll find it, probably mixed in with “vegetable oils”) has lead to dramatic fragmentation. Fresh research by Benny Yeong has revealed that rainforest fragments below a certain size do not yield viable seedlings. This means that the forest will not regenerate. With an increasing proportion of the world’s forests being restricted into national parks, funded by ecotourism, this is a bad omen. Humans must intervene to help sustain forests. Conservation is no longer about stopping deforestation and conversion of land. It’s too late for that. Instead what precious forest we have left must be managed. But with attitudes concentrating on tree hugging to prevent logging, society’s’ interest is fading. Instead there must be a new green revolution. Just as we try to prevent animal population declines and manage the populations of nearly-extinct species, we must do the same for forests. Just go into your local bit of woodland and just experience the sense of awe. The sensation that a forest can provide is just as wonderful as that awe of watching wild animals. Forests are an evolutionary masterpiece of conquests, coalitions, and competitions. Since mankind has had such an impact on the Earth, we can no longer rely on the environment sorting itself out. Intervention is needed in a structured and positive manner. Some people are thinking in this way and making plans. But that does not mean that the cause should be abandoned. We must fight on for our forests. The word poisoning conjures up, to many imaginations, images of deadly dinner parties straight from an Agatha Christie novel or a world of cold war espionage. Whilst these depictions are perfectly justifiable, they often relied on the variety of deadly inorganic or synthetic poisons. Look further back into history, however, and there emerges the use of naturally occurring plant poisons, entwined with some of the most classical and romantic of legends. Scientifically, toxic compounds that may be found in plants often originate as secondary metabolites of which over 100,000 are known. 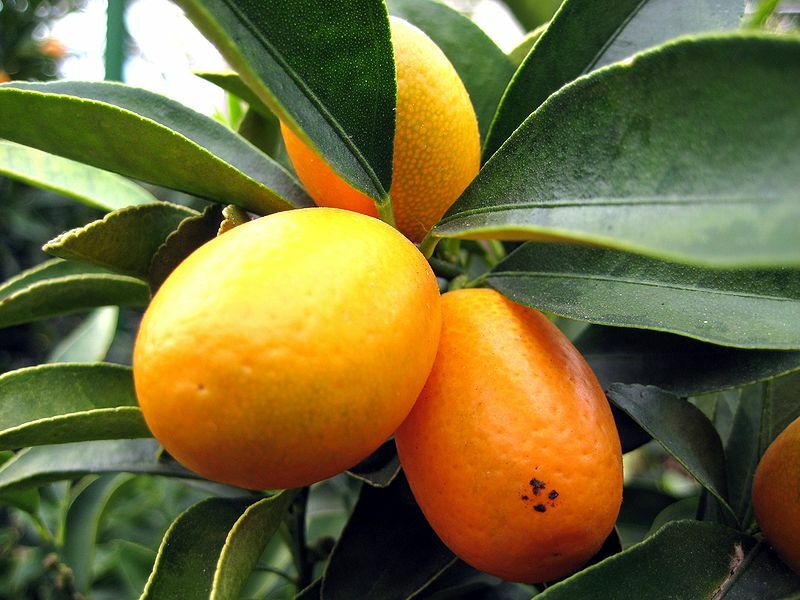 Let’s have a look at some of the most notorious poisonous plants and their history. Belladonna’s attractive berries and flowers have helped to entrain its place in mythology. Perhaps one of the best known poisonous plants and commonly known as belladonna (literally: beautiful woman), this plant produces a variety of poisonous alkaloids including atropine and hyoscine. The plant is a member of the Solanaceae family which also includes potatoes. 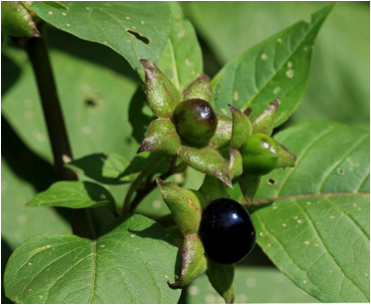 Belladonna’s attractive berries are very poisonous and it is therefore somewhat ironic that the plant has a long history of medicinal and cosmetic use. Macbeth of Scotland, immortalized by Shakespeare, is said to have used the plant to poison an invading English army. Also known as wolf’s bane and devil’s helmet, plants of this genus synthesise toxic aconitine via the terpenoid synthesis pathway. Aconitine is a neurotoxin which targets sodium channels in mammalian neurons. The striking flowers of these plants resemble the hooded clothing of monks and whilst their natural distribution is largely restricted to mountainous regions of the northern hemisphere they are reasonably common features in gardens. Nazi Germany is known to have used bullets coated in aconitum during WWII. 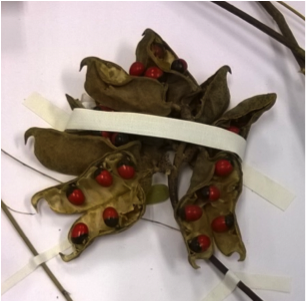 Abrus precatorius berries as recently seen by some enthralled Part II students. 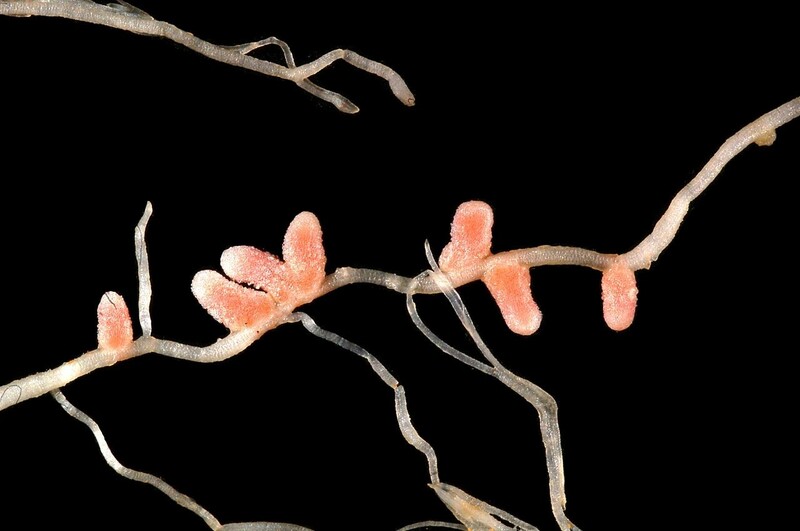 A legume which produces the protein toxin abrin. This is similar to the infamous poison ricin, only around upwards of 70 times as toxic making it perhaps the most potent of plant poisons. The abrin produced is mainly confined to the seeds and the ingestion of a single one may be fatal to an adult human (whilst around 7 ingested berries of the legendary belladonna provide a fatal dose). Traditionally used to make jewelry in areas of South America, aphrodisiacs have also been historically produced from the plant. Native to the Mediterranean, the alkaloids produced by hemlock target neuromuscular junctions and can cause eventual respiratory paralysis and an unpleasant death. The famous Greek philosopher Socrates was sentenced to be executed in 399BC by drinking an infusion of hemlock. It has also been suggested that, in contradiction to traditional beliefs, that the final pharaoh of Egypt, Cleopatra, killed herself by drinking a hemlock-based poison. On the Greek island of Kea, where euthanasia was a societal norm in ancient times, the elderly are said to have drank hemlock infusion once they passed a certain age. 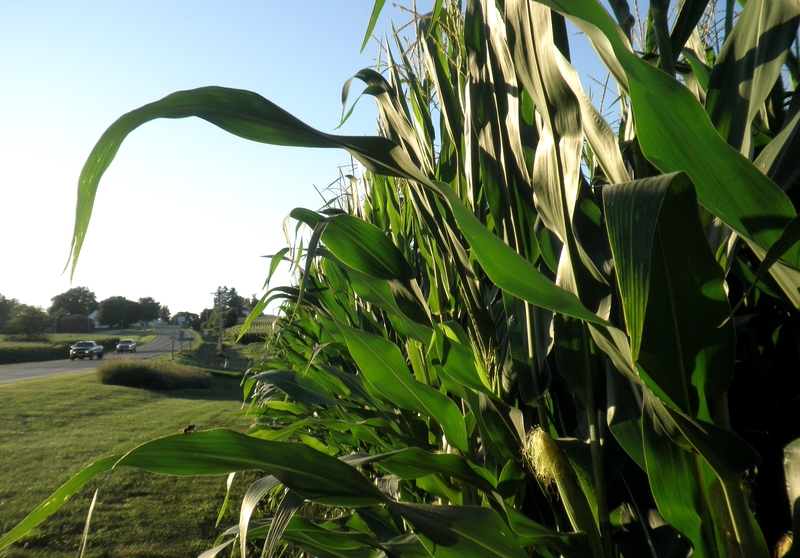 Plant toxins, and their often medicinal potential, give an example of the key place of plant sciences within society. Moreover, a basic level of plant biochemistry and history can give a fascinating insight into the way plants have shaped humanity.